The Acadian forest region boasts a rich diversity of native trees: more than 60 species, including yellow birch, red spruce, American beech and sugar maple, may be found here. This mixed wood forest ecosystem provides habitat for wide-ranging mammals such as Canada lynx and supports breeding bird populations. Less than one per cent of original old Acadian forest remains today. In March 2014, NCC protected the Stehelin property in Nova Scotia, thanks to a generous donation from the Stehelin family and TD Forests. 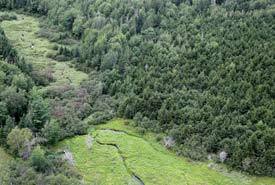 NCC has also protected the Chignecto Isthmus property in New Brunswick, thanks to support from TD Forests. In April 2016, NCC protected the Docherty's Brook property in Nova Scotia, thanks to support from the Government of Canada, TD Forests and other partners. In April 2016, NCC protected two forest sites in the Percival River area in Prince Edward Island, thanks to support from the Government of Canada, TD Forests and other partners.